This review first appeared in the November 6, 1992 issue of the North County Blade-Citizen (now North County Times). 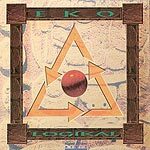 A likable blend of pop, jazz and new age, Eko's music comes across as a blend of Jimmy Buffett's Carribean rock and the chamber music/new age of Penguin Cafe Orchestra. "Morning in Martinique," with its simplistically attractive guitar lines and afro beat, has the same sun-soaked tropical feel to it as the music of Buffett or flutist Steve Kujala. While the other cuts don't quite measure up to "Martinique," all combine upbeat melodic themes laid over non-Western rhythms. An octet, Eko features an effective combination of traditional acoustic instruments (accordion, congas, mandolin, violin) and synthesizers. It's a credit to the band members that they never get caught up in the sound for sound's sake mentality that cripples so many new age bands. Rather, the exotic combines with the comfortable for a very relaxing, yet not vacuous, experience.